Not only the most popular sport, basketball is also inherent in the life of the Filipino people. So the arrival of a celebrity NBA like LeBron James makes public the country welcomed like a king. Enthusiasm Philippine basketball lovers welcome James has been seen since before the Miami Heat’s star to. Distribution of 4,000 free tickets by Nike, which sponsors a series of events and the arrival of James in the Philippines, attended by basketball lovers there to stay for days around the Nike Park, which is located at the Fort, Manila. When LeBron first set foot in the Philippines, on Monday (22/07/2013) early morning local time, local media reported hundreds of fans welcomed the arrival of 207 cm tall basketball player was at Ninoy Aquino Airport, Manila. LeBron was cheered, applauded, his welcome like there was a king who came. When detikSport set foot at the same airport on Monday (22/7) evening invitation to meet face to face with the Nike LeBron, Filipinos welcome the enthusiasm of ‘The Choosen 1’ immediate. Miami Heat small forward arrival was a warm conversation the airport authorities. 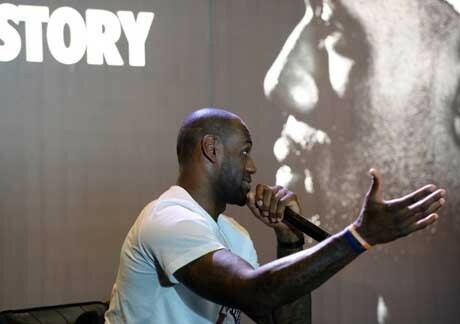 With the theme WIITNESS HISTORY, Tuesday (23/07/2013), Nike held a series of events to bring together lovers of Philippine basketball with the owner’s full name LeBron Raymone James was. WITNESS HISTORY theme chosen to mark the historic occasion the arrival of LeBron’s first time to South East Asia. I double letters in the word WITNESS refers to the Roman numeral two as a symbol of two NBA titles in a row was achieved with Miami Heat LeBron. There are three WITNESS HISTORY event held by Nike in Manila, the meeting with the media, meet fans at Nike Park located in the Fort, and coaching clinic at the Mall of Asia Arena. In addition to meeting with the media, two other events packed with thousands of Philippine basketball lovers. In a meeting with the media, LeBron was impressed with the public welcome the Philippines. “I do not know what else could be expected, it was incredible,” says LeBron, applauded by the media crew.